England 1954Tax /inspection sticker - $15.00 : Bob Hoyts Classic Inspection Stickers, Add a Final Touch to your Restoration! 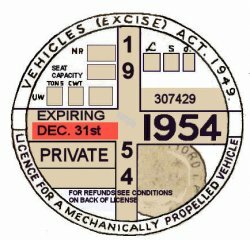 This 1954 England Inspection/tax sticker was restored and reproduced directly from an original. This sticker can be ordered with your cars license plate, year, make and model for an additional $10.00. Click on license plate number, give your license plate, then email us with your other info.